I’ve enjoyed my GTI. Mechanically, it has been problem free, mile after mile. Sure, there have been a few minor issues that were no fault of the car itself. Other than those minor issues, the car has been perfect… until now. My interior blower motor (ventilation) started making some sickly noises around the 70,000-mile mark. It was disappointing on a car that was just over two years old, especially knowing that the blower motor on my Mk3 lasted nearly 14 years and over 375,000 miles. My Mk7’s fan speed began to fluctuate until it eventually became unreliable, working only from time to time. With January’s “Polar Vortex” heading our way, I knew I wanted that fan working and blowing heat for my early morning commutes. When I shopped for the new blower, I was very pleased to discover that it is removed and installed without tools. Getting into a good working position to see under the dash/glovebox and find key blower motor parts was uncomfortable. Thankfully, removing the blower was far less tedious since it has no mounting screws. I took considerable time to discover how to remove my Mk7’s blower. I didn’t see much about how to do it online, not even in YouTube. So I decided to take photographs and shoot a video to share on my YouTube channel. Now that I’ve done the job, I’m very certain I could complete a swap in about 20 minutes, maybe less. The slowest part of the job is swapping the resistor/regulator from the old part to the new part. Remove the two plastic finger screws that hold the foam insulation in place beneath the glove box. Pull down the blower’s locking tab about 2mm to allow the blower to rotate. Rotate the blower ~20 degrees clockwise. The blower will fall free. 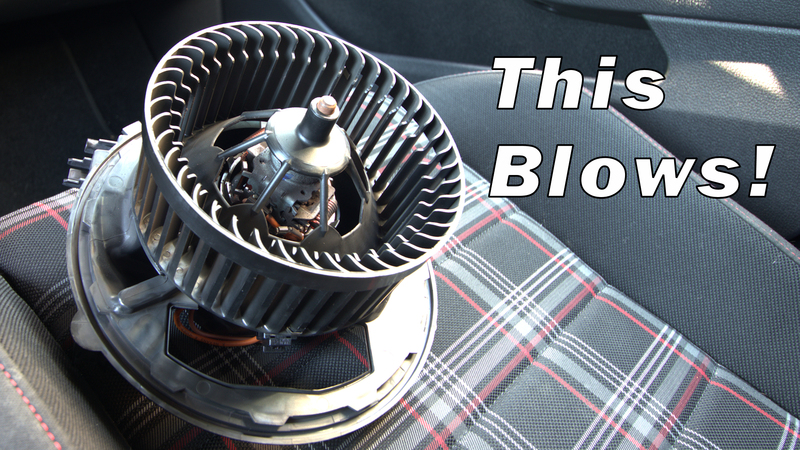 Remove the blower; remember – it is still electrically connected to the car. Unplug the blower’s power cable; move the blower to a working surface. Unplug the resistor power cable. Remove the two resistor mounting screws using a T20 driver (the only tool needed). Remove the resistor and transfer to the new blower; install its mounting screws. Insert the resistor power cable until it clicks. Maneuver the blower into its mounting position; orient the mounting tab towards the firewall and the resistor toward the right. Rotate the blower slightly left or right to get it to seat, then rotate it counter-clockwise to lock it into place. Insert the blower power cable until it clicks. Test the blower. The blower will not run faster than “4” unless the engine is running. Install the foam insulation; make sure to align the vent holes and finger screw holes. Install the two finger screws. Go for a drive and enjoy the fresh air! Someone warned me that my blower’s problem might be with the resistor. After two days of commuting with a functional blower, I’m certain I replaced the correct part. 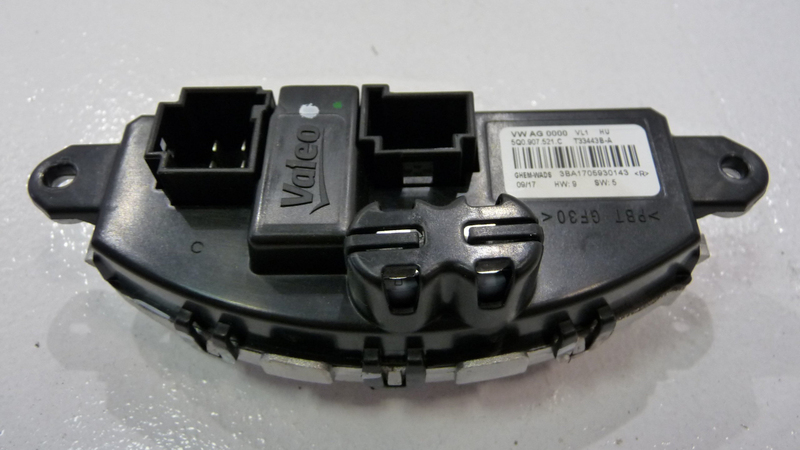 Still, I think Volkswagen got the design right in that they made the parts easy to remove and separate. The fan I have is slightly louder than my original part. That’s disappointing. I’ll live with the extra rumble from the new fan. 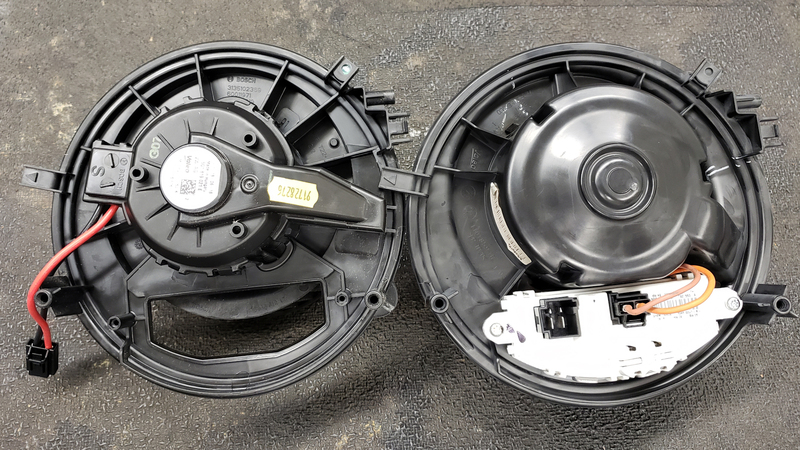 I’m inclined to think Volkswagen perfected the removal aspect of the blower because they expect them to fail relatively frequently. If that’s true, I may have a newer revision in two years. HAHA! The cooling fins for the resistor/regulator. I made some assumptions with my first response: Did you check the fuse? I don’t know which one feeds the blower circuit. But it may have blown if/when something in the circuit overloaded. The rotary switch on the dash is another possibility, but I suspect there’s a computer involved somewhere, too. That means wizardry. You may need to take it to a pro if the fuse is good.